What type of lettuce did I end up with? Okay, so hopefully I'm not annoying anyone yet, but i have a question about my lettuces. They are doing absolutely wonderfully -- but I never knew that lettuces grew like this ?? Don't get me wrong, they're extremely YUM! not bitter, etc. at all, but tonight curiosity got the best of me. These plants at the store were labeled as buttercrunch., which i thought was a heading lettuce. I googled a bunch of pictures, and everything i find looks absolutely nothing like mine. as an aside; i swear my garden gets sun! I swear! I just happen to remember to only go out and take pictures at night when sun is already set. It gets roughly 5-7 hours a day depending on the weather. That looks like a romaine lettuce to me. I'm growing buttercrunch. The leaves are more rounded and the plant more compact. Buttercrunch is a butterhead variety. Not a head lettuce like Iceberg. DoubleDogFarm wrote: That looks like a romaine lettuce to me. I'm growing buttercrunch. The leaves are more rounded and the plant more compact. Buttercrunch is a butterhead variety. Not a head lettuce like Iceberg. DDF's right. Not all lettuce heads are alike. If you go into the grocery store, compare a head of iceberg lettuce to a head of Boston (bibb) lettuce. The difference is that the leaves of some heads are tightly packed together whereas others are loosely packed. Great to hear your lettuce isn't bitter, too bad I can say the same for mine. . I agree to Romaine as the lettuce variety too. It looks like it's starting to bolt so get ready to harvest them wholesale. Check out How Do You Store Lettuce thread for what to do with them all. applestar wrote: I agree to Romaine as the lettuce variety too. It looks like it's starting to bolt so get ready to harvest them wholesale. Hehehe, Gixx - sorry for your bitter lettuce! I've been harvesting them like crazy! With all the heat we've been having here, I'm actually surprised it was remotely tasty. The leaves are sweet (don't know if that's the word for it?) and the end of the stems a bit bitter, bit it's still very edible. My guinea pig is one happy piggy from all the lettuce she's been getting, and it makes my grocery bill happier too, since lettuce is so expensive from the store! Since i've got another patch of romaine going in the box next to it (that's a bit tastier), i've actually been thinking about pulling this patch of lettuces, and putting something else in it's place. It can't be anything too climby since the other half is strawberries. Is there anything in particular that would make a good fill in for this spot this late in the season? I've already planted pretty much everything that i wanted in the garden. I have a feeling the other patch is going to be following along the same lines shortly. That other box is full of Brocolli. Any ideas?? i bet your lettuce is starting to flower, our buttercrunch looks like that when i let it go to seed for next year. best to eat it now or let it go for seeds. um, how can you guys tell it's ready to bolt?? Darceyoh wrote: um, how can you guys tell it's ready to bolt?? 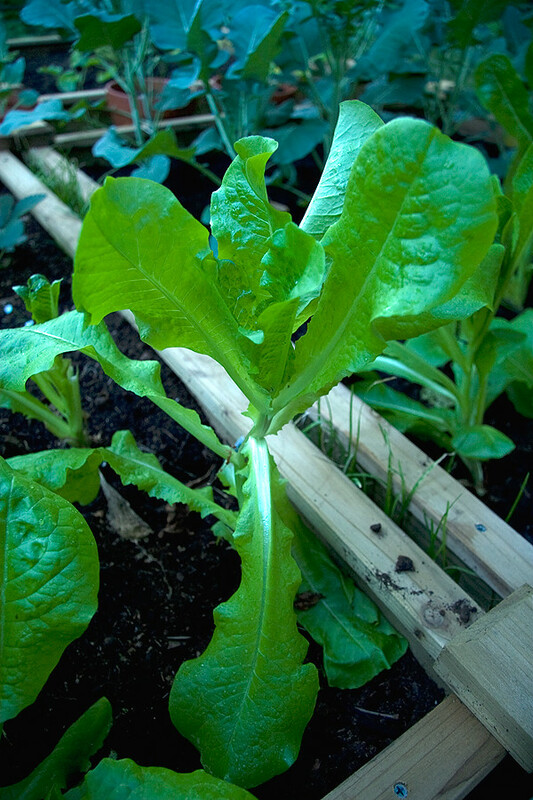 The lettuce plants begin to grow taller very quickly and the leaf shape can change (usually more narrow instead of wide). Some of my plants had a small head growing and it grew taller and opened. You can eventually see the flowers growing. Younger plants will skip forming a head and go straight to flowering when they bolt. i grow buttercrunch every year, and i let some go to seed every year. this is what a plant looks like when its about to go to flower, at this point i stop eating them. i personally would let this plant go to seed, one plant will give you a few thousand seeds. this way you will be able to sow much thicker patches of the lettuce next year. if you just toss some seed in an area(1'x1'), you will get a thick patch of the buttercrunch. giving you a lot of plants to harvest leaves from daily for a continual harvest until late spring. you can sow it in the fall and it will grow all winter. 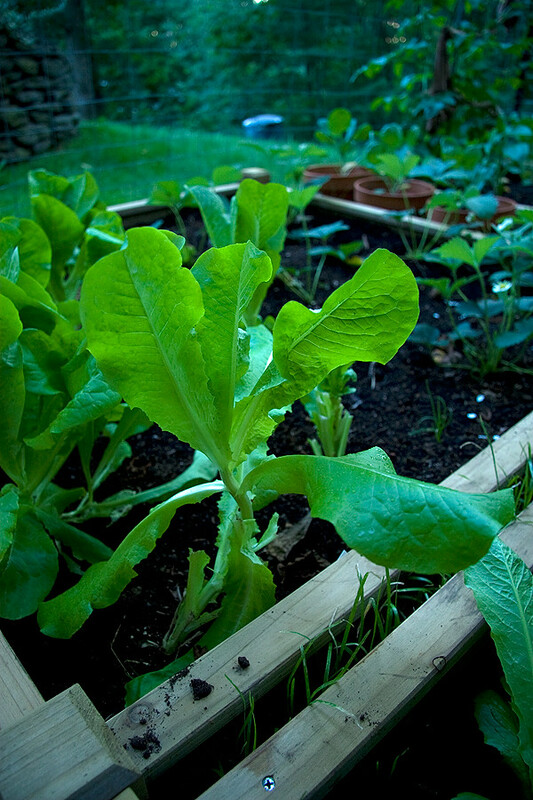 i grow my buttercrunch as a living mulch below my broccoli to maximize efficient use of space. they are good companions. now that I think about it, it's been extremely hot and that's probably exactly what they did. I got no heads at all. I suppose I should be happy that I'm getting any lettuces/plant eatings from them at all I suppose! 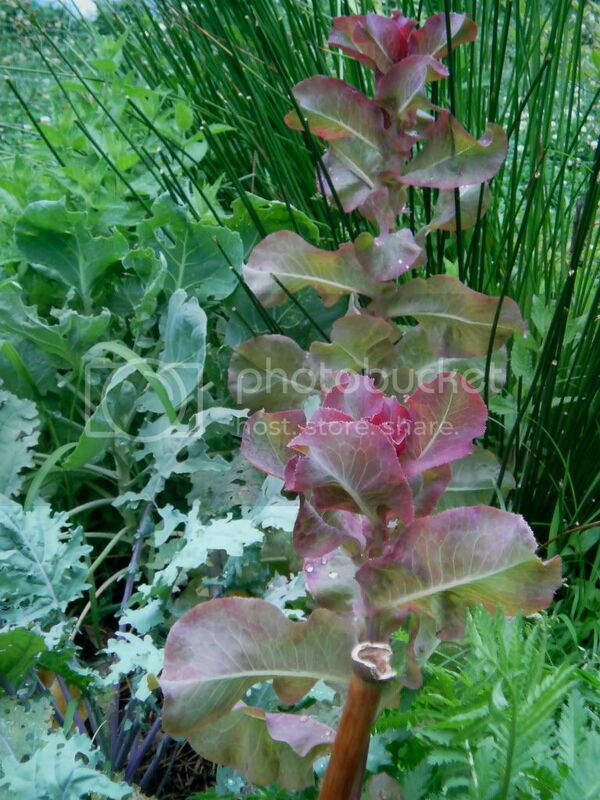 soil wrote: i grow buttercrunch every year, and i let some go to seed every year. this is what a plant looks like when its about to go to flower, at this point i stop eating them. I was actually thinking about that, so will leave it be! I only have some 4x4 garden boxes to work with, nothing too huge though. Could you elaborate a little on the living mulch idea though, please? You plant them in the fall, and let them go all winter, or...? Should i be concerned about spacing for them, or will they thin each other out? Sorry for all the questions, I'm still very much a newb. 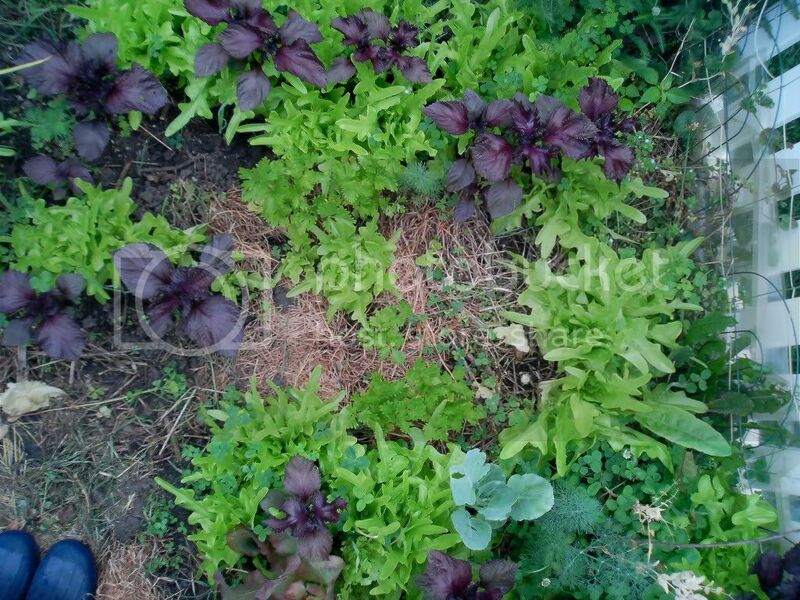 the living mulch is basically a solid mass of lettuce as a ground cover under the taller winter veggies ( broccoli, cauliflower, kale, etc..) wait until the taller plants are about 6 inches and growing good. then under the plant toss some buttercrunch seed( cover good don't be cheap) . they will germinate within a few days. you don't need to thin them out, you wont get giant heads of lettuce this way, but you can collect it properly to have lettuce everyday all winter. to harvest properly you go through and pick out the outer leaves on each plant, in a day, you will have new outer leaves to harvest, and so on. the living mulch is basically just using up all planting space, it keeps the soil moist, keeps heavy winter rains from trashing the soil and compacting it, and you get food out of it. if you want more help shoot me a PM. they wont be poisonous but they might be a bit bitter, not really worth eating imo. but usually when this happens i am sort of sick of eating greens all winter lol. and hey some people like that bitterness touch to there salad. Living mulch -- kinda like this? This is Oakleaf that self seeded. Oh wow, that's absolutely fantastic! I never had any idea, but it's something you can bet i'll be doing! Since I'm in MAss and I get snow, though, not sure if i can quite pull off the same thing you can there in CA? How would it work for winters with snow? And to kind of go off topic... my strawberries are.. well.. making strawberries! Which is absolutely fantastic, but i've heard that they overwinter. What's the best way, once things start getting colder, to keep them safe and ready for the next spring ? I guess it never really occurred to me that i can shelter some plants, save seed, etc. so I don't need to buy plants next year and wait until April for my local nursery to open! Last edited by Liska on Sat Jun 26, 2010 1:23 am, edited 1 time in total. applestar wrote: Living mulch -- kinda like this? This is Oakleaf that self seeded. What does the lettuce in the second photo taste like? It looks lovely and beautiful!